Air-conditioned country house with swimming pool, in the heart of the vineyard in the Dentelles de Montmirail range far from the roads. Exceptional view of the Rhone Valley. Comfort, quiet, easy living, refined and complete interiors, warm welcome. The sheets are provided and included in the price. A private garden of over 1500 m2, the golf ball and the private pool 8m x 4m with an electric component protection. In Provence, near Mont Ventoux and Vaison la Romaine. 1 - La Jacquette air-conditioned country house with swimming pool, in the heart of the vineyard in the Montmirail laces away from the roads. Exceptional view of the Rhone Valley. Comfort, quiet, easy living, refined and complete interiors, warm welcome. A private garden of more than 1500 m2, its ground of ball and the private swimming pool of 8m X 4m equipped with a electric shutter of protection. 2 - The new air conditioned Jiassol, a level of very great comfort, is equipped to accommodate 4 people. The pool 10m x 5m is shared with the owners. 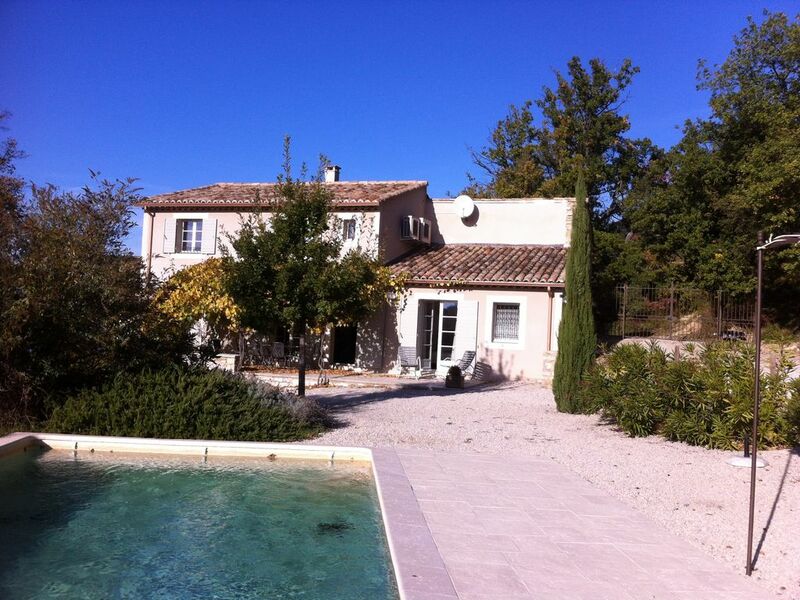 Quiet, away from roads charm and a beautiful view of the Rhone Valley. Garden and golf ball available. In a word, 'You leave LIVE'. * Post, Crédit Agricole and ATM 'DAB'. * The medical practice: doctors, physiotherapists, dentists surgeon, nurses. * The tourist office and the vault of the village winemakers. * The medical practice: doctors, physiotherapists, dentists, nurses. Boules, or other games dry hair Pets: Well behaved dog or cat. It will be necessary to discuss together. Family and friends had stayed in villa La Jacquette in June 2014 and had spoken highly of the villa so my two friends and I were eager to see for ourselves and we weren't disappointed. During our two week stay our hosts Annie and Denis Chamfort were very obliging and helpful and nothing was too much trouble. We enjoyed dining under the vine covered pergola every day with the exception of a couple of times when we had a summer thunderstorm and really enjoyed the closeness of the village of Sablet and surrounding villages for wonderful restaurants for beautiful food and wine. We did a cooking school in Vaison la Romaine and a wine tour from Sablet and the Tuesday market at Vaison la Romaine were all highlights. The villa was spotless, well maintained and equipped with everything we needed/wanted. We could have played boules as there was an area to play, but we didn't and the swimming pool was heaven on a hot afternoon. I would thoroughly recommend villa La Jacquette and would love to return one day. Thank you Annie and Denis. Wir haben nicht zum erstenmal ein Ferienhaus der Familie Chsmfort gemietet. Das allein spricht schon von herausragender Qualität und sehr schöner Lage. AUch die Familie Chamfort ist sehr freundlich und stets hilfsbereit. Merci beaucoup. A bientôt et toutes nos amicales pensées à vos parents. This beautiful home is located at the end of a small road in a vineyard. You have a beautiful view of the town Sablet and the whole valley. Especially it is very romantic wo swim in the evening in the pool looking to the illuminated village of Sablet. Also the children has plenty of space for playing. The house is beautifully decorated with furniture, paintings and decorations. Some rooms like the bedroom have particularly high ceilings. The bathrooms are very nice and build with luxury material. One bathroom is extra big. It was wonderful to do the breakfast on the terrace every morning and dinner in the evening during sunset. Nous venons de passer trois jours au gite de la jacquette à Sablet, un véritable petit paradis ,avec une vue impressionnante de beauté et d'espace sur le village et la vallée.L'équipement est parfait, on se trouve vite chez soi car tout y est chaleureux, bien pensé, décoration de bon goût.De belles balades à pied ou à bicyclette depuis le domaine sont un plus . Ce gite est à l'image des propriétaires, accueillants et chaleureux , discrets et pourtant bien disponibles. Une chaude adresse pour retrouver la sérénité .La région est des plus belles, les caves accueillantes comme les gens d'ici", ne pas attendre trop longtemps pour y revenir. cette location perchée au milieu des vignes est un véritable havre de paix! tranquillité,vue imprenable, confort... bref tout a contribué à rendre notre séjour agréable. La maison est très confortable et bien agencée. on se sent très vite comme chez soi ! les propriétaires sont très sympathiques et prévenants. la piscine est parfaite. nous avons pu faire de belles randonnées au départ de la maison. cette location est idéale pour les familles avec enfants et ados, pour les personnes qui cherchent le repos. Nous espérons y revenir lors d'un prochain séjour dans cette magnifique région ! Notre séjour à Sablet en mai dans un cadre magnifique avec une vue imprenable sur le village nous a enchanté. D'abord, l'accueil chaleureux des propriétaires très sympathiques et tout en simplicité; ensuite le cadre superbe, au calme en pleine campagne, au coeur des vignes et en même temps proche de commerces; enfin la maison, décorée avec beaucoup de gout, d'un grand confort et toute équipée, superbe! De plus, il y a beaucoup d'activités variés dans le coin pour plaire a tous les membres de la famille. Nous en sommes vraiment ravis et nous la recommandons sans problème tant les prestations sont de qualité. Nous espérons pouvoir revenir bientôt au "Domaine La Jaquette". Soon to receive you in the heart of our great country.